First-Year Seminars: From Poverty to the Past Professors share the inspiration for their first-year seminars, and what they hope students will take away. 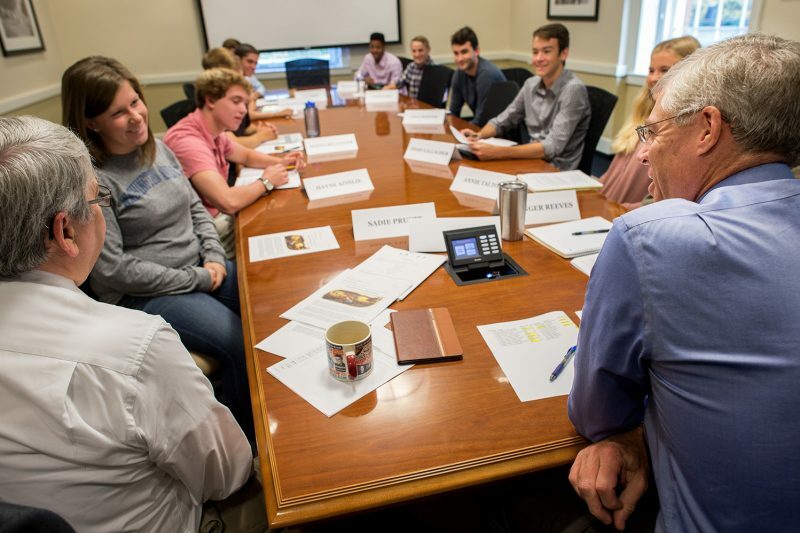 Politics Professor Bob Strong (far left foreground) and university president Will Dudley (far right foreground) co-teach a first-year seminar, Philosophy of Education. With more than 1,200 courses in the catalog, the array of curricular options at W&L can be daunting to a new student. First-year seminars are designed to introduce small groups of students to a field of study through a special topic, issue or problem in an intimate seminar setting. These reading- and discussion-based seminars, which focus on projects, hands-on experience and writing rather than exams, address a range of topics that vary by semester. In Fall 2017, for example, first-year seminars address such subjects as death and dying, the history of W&L, and equality and difference. Several professors who are teaching first-year seminars this semester offered thoughts on their courses, including the origin of the idea and what they hope students will glean from the experience. I think we all come from our high school experience with views about poverty shaped by the confines of the world we inhabit. That includes the physical, the technological and the media landscape we used as filters. I wanted a course that would penetrate those filters, and expand the parameters of that view. I want my Media’s Lens on Poverty students to understand that the media serves as a looking glass through which they can see poverty in a fresh, different, and more expansive way. When they finish the course, they will understand how the media often shapes their view of the poor. And they will realize that, as C.S. Lewis might have said had he lived in our times, what you see depends on the media you use. I have been a part of the “working group” on W&L’s African-American past ever since its creation in 2013 and have learned an enormous amount about institutional history, including the matriculation and completion of degree requirements by John Chavis in 1799; the Robinson bequest of his estate that included 84 enslaved African Americans; and other events near the end of the 19th century. I had to share the material I had learned with incoming students. After a brief conversation with Provost Marc Conner, I decided to expand the course to include some focus on slavery in Lexington and Rockbridge County. Aside from introducing first-year students to this material, I wanted to have them expand on this research by producing in-depth research papers that require utilization of the university’s extensive collection of primary source materials, along with many secondary sources. I want students to develop an excitement for historic research and the process of developing new knowledge. Additionally, I want them to understand that the study of history, despite its subject matter, is important and always nuanced. It forces us to view happy and disheartening events within a wider historical context and through differing perspectives. Slaveholding may be a difficult story for many people, but it is an undeniable part of our past. Hopefully, my students will leave the course understanding that history is usually complex and complicated. 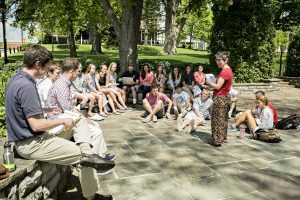 The course is on the nature of liberal arts education and how an institution like W&L is organized to provide an outstanding one. It’s a mix of philosophy and policy, which is perfect for me in my dual role of professor and president. It also raises interdisciplinary issues on which my co-teacher, Politics Professor Bob Strong, and I provide complementary perspectives. I hope students will take away a better understanding of what they are trying to achieve in college and how they can make the most of their opportunities at W&L. Definitions are the starting points around which people frame their opinions, and have implications for what people consider rational, fair and just. I really wanted to open a class about race and health because those are two important ideas that most people take for granted and never stop to question. In particular, people tend to conceptualize both race and health as a property of each individual, and as biological. But are they? And how do our conceptions about both affect how we think they are related to each other? For example, given that racial disparities in health outcomes do exist, I wanted students to explore what those differences signify. Do these outcomes reflect physical or genetic biological differences between races, or cultural differences, or differential social position and life experiences? Moreover, does the way society thinks about what “being healthy” is limit the way we are able to reconcile its relationship to race? In all, I wanted to create a space where students could come to understand, but question, their fundamental assumptions of what race and health are and their relationship to each other. I really hope the students in my class realize how complex race and health are as ideas. While they might not have answers to course questions by the time we finish, I hope they at least recognize how much subtlety, nuance and room for disagreement exist in our ideas about race and health. But the bigger takeaway is that I hope students come to value the importance of understanding and talking about fundamental assumptions in conversation. As such, I hope my students learn how to examine and analyze both their own assumptions about the world, but also those of others (especially others they disagree with). Most of all, I hope they come to question other everyday concepts/situations that they may have never thought about before, because this same issue undoubtedly exists beyond the topic of race and health. How to live our lives in the shadow of our mortality is a question that faces most of us, and one that I have been thinking about more as I age. And it’s a topic that has been addressed in great literature, social studies, film and religious writings. I hope students will leave this course with a critical understanding of how some modern thinkers and a range of religious writings have confronted the topic of death, a greater personal comfort in thinking about it, and developing their own philosophy of living in the shadow of death. The Geology Department wanted to offer a first-year seminar because the intimate environment is ideal for engaging students in science. In my course, I have sought to utilize active learning approaches increasingly shown to stimulate interest and improve student learning outcomes. Class time is devoted to experiments, field work and other hands-on exercises that let students act as scientists instead of passively listening to lectures about science. Although this is a geology course, my greatest goal is that students leave my class better prepared for whatever subjects they choose to pursue in the future. Much of the course content is geared towards general problem solving and critical thinking skills, and I also discuss the learning process itself in the hope that students become more aware of how they can maximize their own learning. Additionally, I hope all students leave with a stronger understanding of the scientific process and a deeper appreciation for the beauty and majesty of our planet. To read more about first-year seminars at W&L, click here.